Former NBC5 reporter and Republican congressional candidate Grant Stinchfield will be heard -- but not seen -- in a big way later this month. After joining Dallas-based KLIF radio (570 AM) as a Saturday night talk host in December 2012, Stinchfield is being ramped up to a four-hour program five days a week. KLIF will air The Stinchfield Report from 3 to 7 p.m. weekdays, starting on Feb. 17th. He’ll also continue with his one-hour Saturday show, which airs at 9 p.m.
Stinchfield is replacing Kurt Gilchrist, who’s been anchoring a news and information program on KLIF for the past two years. Gilchrist “has done an outstanding job” and will remain with KLIF through March, operations/program manager Tyler Cox said in a publicity release Wednesday. Stinchfield left NBC5 in April 2011 after buying a Kwik Kar Auto Lube and Repair shop in Irving. He still owns the business and plans to keep it running. In 2012, Stinchfield ran against incumbent District 24 congressman Kenny Marchant, getting more than 30 percent of the vote against the veteran Republican. 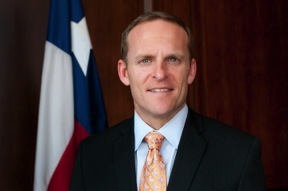 Stinchfield’s marriage, to Amy Vanderoef of WFAA8’s locally produced Good Morning Texas program, has not survived his various post-NBC5 activities. They were divorced a little less than a year ago, he said. They share custody of a son, Wyatt, who was 2 when Stinchfield ran for Congress.